Jack Jones is an amazing communicator to all mankind expressing the basic innocence in each of us by simply reminding people, through song, that they are loved. A double Grammy winner, Jack performs around the globe to sold-out audiences in venues ranging from Jazz clubs to the London Palladium. From the thematic threads of his shows to his ability to make the largest halls intimate, Jack Jones is the very definition of a complete and total entertainer. Whether he performs with his trio or full Symphony orchestra, his musical perfection, vocal passion, phenomenal breath control and impeccable phrasing all unfailingly illustrate why he stands with the luminaries. There is only one Jack Jones. Born in Hollywood, California, on the night his singer/movie star father, Allan Jones, recorded his hit, “Donkey Serenade”. Jack would make his famous parents ( his mother was the elegant ’30’s actress Irene Hervey) especially proud of their award-winning son for the diversity and breadth of his talent. Jones attended University High School in West Los Angeles, while also studying drama and singing with private teachers chosen by his father. A young athlete, he gave up his track and football team sports to devote himself to serious study of the arts. Uni High was a school attended by teenagers from all economic walks of life. Ever conscious of his privileged life as the son of a famous show business family, he went out of his way to play down this part of his life with his friends, not knowing that after his graduation and parents’ divorce, he would be financially strapped and have to start from scratch like most of the other students. One of his most memorable experiences while in high school was when one of his friends, Nancy Sinatra, invited her father to sing in the school auditorium. It left an indelible mark that helped shape Jones’ career choice. Jones’ professional debut was a brief stint as part of his father’s act at the Thunderbird Hotel and Casino in Las Vegas when he was just 19 years old. He went out on his own three weeks later, working odd jobs including as a gas station attendant, to support himself while pursuing his singing career. His first break came when a demo he recorded for songwriter Don Raye found its way to Capitol Records. While with the label he recorded a few singles and an album, which he admits was mediocre. Although he eventually left Capitol. One gem from his album, “This Could Be The Start Of Something Big”, caught the attention of a San Francisco club owner who booked him for a three week run at Facks. While performing there, he was discovered by Pete King, a producer and artist for Kapp Records who quickly signed him to the label. Still working at his “day job” as a gas station attendant when his first album on Kapp was released Jones, while washing a customer’s windshield, was surprised to hear one of his cuts playing on the car radio. He could now legitimately hope that his “day job” days would soon be over. As his career gained momentum, Jones developed a deep appreciation for well constructed songs that also have emotional appeal. His respect for songs that tell stories with meaning and beauty led him to record works by the greatest balladeers of all time: Sammy Cahn, Jimmy Van Heusen, Cole Porter, the Gershwin’s, Harold Arlen, Michel Legrand and Alan & Marilyn Bergman. He was inspired by great Jazz instrumentalists he discovered during his teen years such as Gerry Mulligan, Clark Terry, Buddy Rich, Bob Brookmeyer, Dave Pell Octet, Marty Paiche Dectet, Shorty Rogers and the Giants, and Count Basie. Jones’ talent and commitment to his art earned him two Grammy’s for “Best Pop Male Vocal Performance” with his singles “Lollipops and Roses” by Anthony Velona and Bacharach/ David’s “Wives and Lovers”. His release, Jack Jones Paints A Tribute To Tony Bennett, was nominated for “Best Traditional Pop Vocal Performance”. He was also nominated for “The Impossible Dream” and his recording of “Wives and Lovers” was nominated for “Record of the Year”. His hit records include “The Race Is On”, “Lady”, “Call Me Irresponsible”,and “What I Did For Love”. On April 13, 1989, he was honored with his own star on the Hollywood Walk of Fame, close to where his father’s star is located. He is also renowned as a leading interpreter of musical theater -with acclaimed performances in “Guys and Dolls”, “South Pacific”, “She Loves Me”, and “Pajama Game” . Over the years he has guest-starred on countless episodic and/or comedy television series. Most recently he starred as Don Quixote in Man Of La Mancha in the national tour. Most recently, Jack has completed a guest-starring role in the British comedy film: Cruise Of The Gods. Admirers of Jones’ talent include artists who influenced him as a young singer: Sinatra who said, “Jack is one of the major singers of our time,” Mel Torme called him “the greatest ‘pure’ singer in the world” and legendary composers Sammy Cahn and Michel Legrand. In 1971, Jones honored Michel Legrand by recording the first complete vocal album in English of the French composer’s songs. Released by RCA, Jack Jones Sings Michel Legrand is an album which exquisitely showcases the vocalists art and a recording that Jones counts as one of his favorites. In 1997 he recorded New Jack Swing for Honest Entertainment, which introduced Jones to a new generation of fans with hip, swing renditions of “Every Breath You Take”, “Have You Ever Loved A Woman”, Keb Mo’s “Dangerous Mood”, “All Or Nothing At All” and the classic “Mack The Knife”. With over 50 recorded albums (17 of them chanting Billboard’s Top 20) and consistently sold-out world tours, Jack Jones continues to charm audiences with his wit, sensitivity and vocal power. In addition to a successful recording career, Jones’ impressive credits include film and television roles; an internationally syndicated TV variety show; performances at Carnegie Hall, the Kennedy Center, and the White House. He has also performed and later recorded popular theme songs for film and TV (“Love with a Proper Stranger”, “The Love Boat”). On his second release for Honest Entertainment, Jack Jones Paints A Tribute To Tony Bennett, Jones pays homage to a friend and an American icon. He counts Bennett among those vocalists who most influenced his style (a small but elite group that includes Mel Torme, Sammy Davis Jr., Billy Eckstien, and Frank Sinatra). Professional relationship aside, Jones and Bennett have been friends since their meeting at Chicago’s Palmer House Hotel in the late 60’s when Jones attended the last show of Bennett’s engagement at the Empire Room, before opening in the same room the following night. Of his tribute album, which features some of Bennett’s signature songs, Jones says, “This album is my way of saying thanks to a dear friend.” In selecting songs for this album, he chose three of his personal Bennett favorites, “Skylark”, “Shadow Of Your Smile” and “You Must Believe In Spring”. 2008 marks his 50th anniversary in show business! In the early summer of 2008 the world’s most recognized hotel brand, Holiday Inn Hotels and Resorts, launched their “M.B.A.” (Master in Business Accommodations) marketing campaign bringing the timeless voice of Jack Jones singing a new recording of “The Love Boat Theme”. Jones also recently shared his voice with a whole new generation when he sang “Boat of Romance” as part of an episode on the Emmy-nominated Disney Channel animated musical television series Phineas and Ferb. Jack Jones released the next chapter in his long history of making hits, Love Makes the Changes: The Lyrics of Alan and Marilyn Bergman. A tribute to the lives and shared love of Jack’s good friends and celebrated songwriters, Alan and Marilyn Bergman. During their distinguished career, their songs have been nominated for sixteen Academy Awards, for which they have won three: “The Windmills of Your Mind” in 1968, “The Way We Were”: in 1973, and the score for “Yentl” in 1984. This CD is available in iTunes for digital downloads and jackjonesmusic.com for traditional CD media. 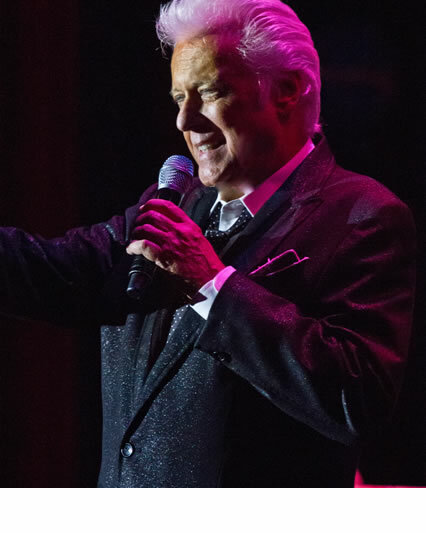 Today, Jack can be found performing concerts to sold-out audiences around the globe at performing arts centers, casinos, symphony halls and even intimate cabarets. Jones’ musical perfection and vocal passion unfailingly illustrate why he stands with the luminaries.